India’s slums provide a grim counterpoint to the aspirations and growth of urban India. Bang in the middle of our great cities, the modern day temples to the Great Indian Growth Story, slums are a reminder of the brutalising poverty and inhuman conditions that is still the lot of a majority of our population. Our attitude to this underclass of urban poor is betrayed by our lack of public outrage as the government rounded up beggars in the run up to the Commonwealth Games, telling them to get out of the city or go to jail. Children at a Music Basti workshop. Photograph by Shiv Ahuja. Things aren’t all bad, though. The plight of the slum dweller has always been an emotive issue and many individuals and organisations have been working hard to provide them with the necessary aid and support. We’re going to focus on one organisation that works with slum children in Delhi. Music Basti is a music education and awareness project that was started in 2008 with the support of the Integrated Development Education Association. It began as a response to the reality that a majority of children are deprived of an arts based education and exposure and is an example of the recent shift in approach that emphasises a more holistic way of looking at development, beyond the staple of roti, kapda, and makaan. To quote 22-year-old founder Faith Gonsalves, “I have great respect for and belief in music as a medium of self-expression, and self-expression is something that is often extremely challenging for the children that Music Basti works with. The power to create something, own it, and be proud of it is what is truly empowering. Music is an excellent medium and provides an excellent medium to promote every child’s right to self-expression, and to slowly realising and claiming all their rights.” Faith got the idea for the program from her own experience and involvement in music. Music Basti instructors. Photograph by Shiv Ahuja. The program is aimed at ‘at risk’ children, such as street children, runaways, and orphans. 300 such children are part of the project, and Music Basti supports the ‘Dil Se’ campaign that runs three centres (two for girls and one for boys) in Delhi. The project aims at empowering these children by giving them a platform to express themselves through music. It also tries to create awareness about the problems faced by them. The music acts as a tool to help the children develop important social skills and become more confident. 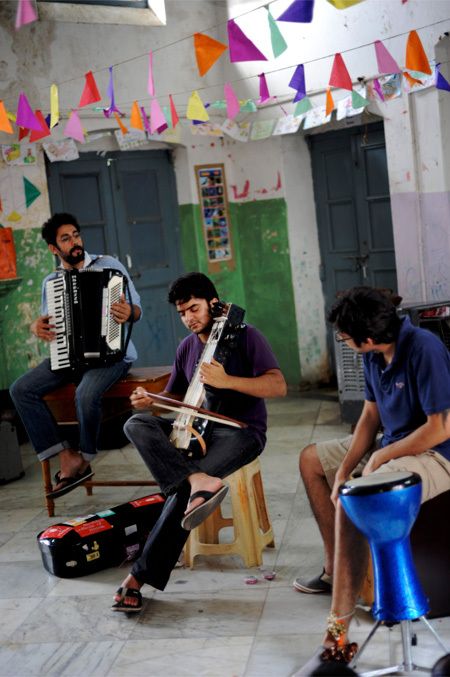 The program holds regular workshops at the three centres, which are conducted by volunteer musicians. They’ve conducted special workshops featuring national and international artistes including Advaita, Five8, Vishal Dadlani, Warren Mendonsa, The Yale Gospel Choir, and others. The children are taught to play instruments and take part in songwriting and recording projects. Select groups of students are also chosen to play at public performances organised by Music Basti. These include performances at the iCongo award ceremony for the Karamveer Puraskar and C.R.Y.’s program ‘Sabko Shiksha Samaan Shiksha‘. Sarangi exponent Suhail Khan and percussionist Suchet Malhotra are among those who have volunteered their support, along with music producer Ian Wallman. Andrew Dubber, the founder of Music Think Tank, worked with Music Basti to record an album of songs featuring the street children. They have created a few short films to document their work. They also organise other initiatives, such as a toy donation drive for the children in collaboration with the Hard Rock Café. Music Basti has been selected for the Change Looms program (Ashoka and Pravah) and Vikalp (U.N.E.S.C.O., The Y.P. Foundation, and U.N.P.F.) in 2009 and were invited to speak at Soundbound in 2010. If you would like to help and volunteer, you can sign up over here or contact them at musicbasti@gmail.com. Here’s hoping that Music Basti continues to make a difference with its message of empowerment through creativity.